On the 27th of July 2003, Murray and Gary Carter were inducted into the MBL Hall of Fame. On the day of his indictment, around 30,000 people attended Murray's speech on how difficult it was to make it into the Hall of Fame. The man said that the indictment is never about an individual, but the team effort that increases chances of being recognized as one of the true greats of the game. He thanked the Baltimore crowd for making him one of their favorite sons as his speech ended with chants from the crowd going "Eddie, Eddie." When leaving the conference, he provided some Northwood children with 12 autographed bats, 100 autographed programs, as well as about 25 autographed baseballs and told them "never forget where you come from." Eddie Murray featured in three World Series Championships and eight All-Star teams. He claimed the Rookie of the Year Award when he made his debut in the American League in 1977. With 504 homers under his belt, Murray stands 25th on the list of all-time top home run scorers in the MLB. His 1917 RBIs place him eighth on the all-time career list. Murray bagged the Gold Glove Award for three years in succession between 1982 and 1984. Although Murray succeeded in reaching the 500 home-run milestone, he remains the player to hit the lowest number of highest single-season home runs with just 33. 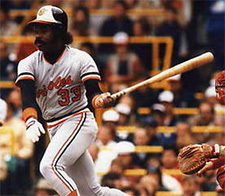 His hard work and success on the pitch urged the Orioles to retire his number 33 jersey in 1998. In 1999, The Sporting News released a list of the game's greatest players and Murray was placed at number 77. He was also a final nominee for the MLB Team of the Century. Murray recorded 222 intentional walks during his career, placing him sixth on the all-time list. After he was inducted into the game's Hall of Fame in 2003, Murray donated the money for Baltimore's Carrie Murray Nature Center – an NGO named to honor his mother. When it comes to hits, he is the fourth highest hitter in the Orioles' history. He is also the Baltimore franchise's second highest all-time home run scorer. He holds the fourth-most number of games by a single player for the Orioles. 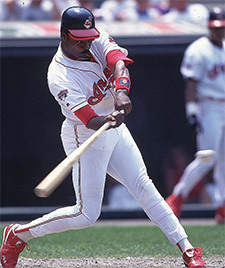 As a result of his work ethic and dedication, Eddie Murray was honored with a bronze statue of his left-handed hitting position at Oriole Park which was unveiled on the 11th of August 2012.